I was able to finish four little dresses this weekend. The first took the longest since no matter how hard I try, I am not a pattern reader. I like to see things done so it takes me a try or two ( sometimes three) to be able to *see* what I am reading. After I figured out what I supposed to be doing I had an assembly like ready to go. It only took a few hours not much more to make the three remaining dresses give or take 30 minutes since apparently people living here want to eat and still need laundry washed. Hopefully there will be a playdate organized soon ( I am trying) to have many hands making these adorable dresses to send to some very deserving girls. Alexander Henry Kleo is one of my all time favorites. I have a skirt in the black/red colorway. Ginger Blossom Tiles by Sandy Henderson! I can see a little girl feeling like a princess in this dress! 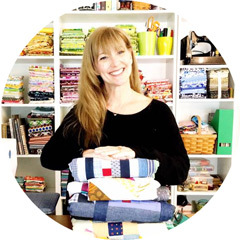 Amy Butler Love is one of the happiest fabric lines EVER and this one makes my heart sing! The love for making these prompted a stash raid! Everything has been properly washed and dried and is waiting to be ironed ( any volunteers?) It may be time to teach the kids to iron,LOL! It's a beautiful pattern and you've definitely chosen some fabulous fabrics. I have some (well, a small bit now) of the Amy Butler Love and it's gorgeous. Thanks for making all these! Is there a way to get involved in this project? I would love to help make these little dresses. I make dresses for an orphanage in Haiti. Could you tell me what pattern you are using? Beautiful fabrics for the dresses. They are so joyful! Adorable! What dress pattern is this? Please, do post the pattern info and the direction these cuties are going!! Thnx for the lovely 'share' of your talents!!!! They all are just adorable and it is great to know that they will sew up quickly. It's Simplicity pattern 2377. It was shown in the last post. Darling dresses. Every one of the dresses is beautiful. The little girls who get them will all feel like princesses. I am an Amy Butler fan. Great job on all four!